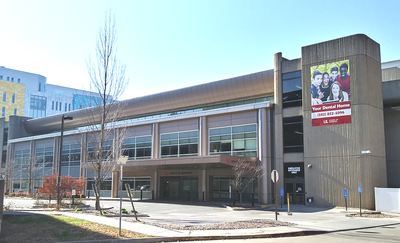 The School of Dentistry is located on the campus of the University of Louisville Health Sciences Center in downtown Louisville, which is part of the Louisville Medical Center complex. When visiting the School of Dentistry, please enter through the doorway located underneath the School of Dentistry awning near Muhammad Ali Blvd. If you have questions prior to your visit, or upon arriving, please call 502-852-5096 or stop by the main information desk located directly inside the visitor entrance. The School of Dentistry allows for patient/visitor drop-off at the front entryway. If patient drop-off is desired, please enter by turning left from Muhammad Ali Blvd. or off Preston Street just before the Novak Center for Children's Health building turn left. Click here to view a map of the new vehicle entry location. Parking meters (short term) are located all around the School of Dentistry. Limited metered parking spaces are located on both Muhammad Ali and Preston Streets. Meters around the School of Dentistry are IPS meters and will accept credit cards. Please ensure that you have adequate time on the meter to avoid receiving a ticket. Use of parking meters is not recommended for long visits to the school. Click here to see the city's current meter policies and rates. 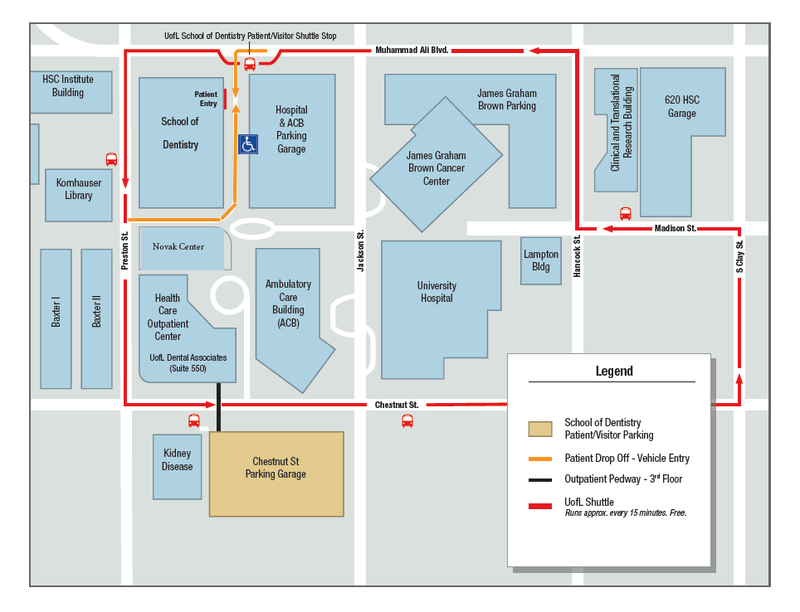 Visitor/Patient pay parking is located inside the UofL Health Care Outpatient Center parking structure located at 414 E Chestnut St, Louisville, KY 40202. Following your appointment, please check with a patient service representative at the School of Dentistry front desk for a receipt that allows for $1 off the garage-parking fee. Limited parking is available near the School of Dentistry visitor entryway for guests with disabilities. Please be sure to have a decal on display, as you can be fined $200 if one is not present. If you are in need of wheel chair assistance, or other special accommodations, please call 502-852-5096 prior to your appointment. To better serve visitors to the School of Dentistry, the UofL shuttle will now make two additional stops as part of its regular route; one just to the left as you exit the first floor of the Chestnut St. Parking Garage and the second along Muhammad Ali Blvd. near the front entrance of the School of Dentistry. The UofL shuttle is free and runs approximately every 15 minutes. We hope this will assist in your visit to the school! To view shuttle stop locations, please see map above. For specific driving directions enter the locations below in your favorite online mobile app, or see generalized directions below. For patient, 15 minute drop-off, enter from 452 E. Muhammad Ali Blvd.and turn left or enter from Preston Street just before the Novak Center for Children's Health and turn left into the School of Dentistry . 1. Take I-65 North to Exit 136A, Broadway/Chestnut Street. This ramp exits onto Brook Street. 2. Continue north on Brook Street for two blocks. 3. Turn right on East Chestnut Street. 4. Continue two blocks, parking garage is on the right (414 E Chestnut St). 1. Take I-65 South to Exit 136C, Jefferson Street Downtown. 2. Stay in the far left lane of the ramp for Brook Street. 3. Proceed to the second traffic light to East Market and turn right. 4. Go two blocks to South Preston Street and turn right. 5. Continue four blocks south on South Preston Street to reach East Chestnut Street. 6. Turn left on East Chestnut Street, parking garage is on the right (414 E Chestnut St). 1. Take I-64 or I-71 to I-65 South. 2. Follow the directions above.